Madrassa education critics in Pakistan have long argued that the madrassa life and curricula are too narrow and inadequate to prepare graduates for life in the modern economy and the kind of jobs young people need to fill. There have been some efforts and steps taken recently to broaden the syllabus to add more secular education such as science, math and computer literacy. 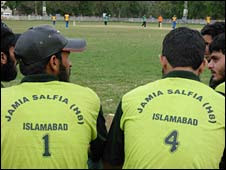 The most welcome news recently is the organization of an inter-madrassa cricket tournament in Islamabad. The BBC's Haroon Rashid reports that "batons have been replaced with bats and balls. It looks as if the seminaries are trying to salvage their badly-dented reputation by holding this tournament - the first of its kind." "We wish to bring them into mainstream," event organizer Tahir Inayat of Eclat Concepts told the BBC. "We have been organizing different sports events for regular schools and colleges. But we thought that we needed to do something for these uncared-for students of religious madrassas." Twenty-four teams representing as many seminaries in Islamabad are vying for the top slot in the eight-day floodlight tournament. However, this tournament has not been without controversy among the Pakistani clerics. The Urdu newspaper Daily Jasarat quoted the leaders of Wafaq-ul-Madaris Arabia Pakistan and Jamiat Ahle-Sunnat as saying that a move by an Islamabad-based NGO to organize a cricket tournament between madrassas is a conspiracy against the religious seminaries. The Wafaq-ul-Madaris Arabia controls the largest number of madrassas in Pakistan. According to the report, the madrassa leaders said, "None of our madrassas will take part in the cricket tournament and if anyone did, we will take action against it as per the rules." These views were expressed during a press conference by the Deputy Secretary of Wafaq-ul-Madaris Arabia Pakistan Maulana Qazi Abdur Rashid and several Ulema. While this cricket tournament represents a positive change, it is clearly not going to be easy to continue in this direction. The fundamentalist clerics will oppose anything that changes the status quo. They fear the loss of power from changes that help the poor madrassah students focus on anything other than their brand of Islam based on suspicion and intolerance of anything they see as foreign or different. It seems that the Hadith of Prophet Muhammad about "seeking knowledge even if you have to go as far as China" does not carry much weight with these self-styled ulema. and almost all so called madrassa education critics are those who are ignorant about the education system and have never visited any madarassa to find out actual syllabus. Such so called ignorant critics never came up with any documentary proof that madarassa syllabus is "Narrow" while in reality thing is that students of madarasa who are actually poor are taught subjects which are not even taught in so called universities of Pakistan. Subjects like Logic,philosophy etc are not common in Pakistani syllabus. as far adjusting with students of so called non-religious modern school students, Irony more and more graduates are unemployed these days than ever. Doctors,enginners are not getting job and comiting suicide. Some fool graduates even leave their profession and become anchors on TV shows and musician. One can always visit Darul Uloom Karachi ,Binori town and several others to find out truth. "Ignorance should not be an excuse". who cares what BBC says? BBC type crap always run a mission against a community, this time they have been fed by right wing of Americans to continue their troll against Islam. Haroon might be living in fools paradise but reality is that after right wings "war on terror", Islam spread more and more ignorant so called Muslims got inclined towards Madrassa systems and their students. I am one of them. Haroon belongs to that propaganda machine which is fed by that helpless and weak right wing western cabal who has been frustrated enough that they are not being able to beat Islam all over.